The Halton Outdoor Club is dedicated to providing an exciting and varied cross-country skiing program. Our program is suitable for everyone from novice to expert skiers. 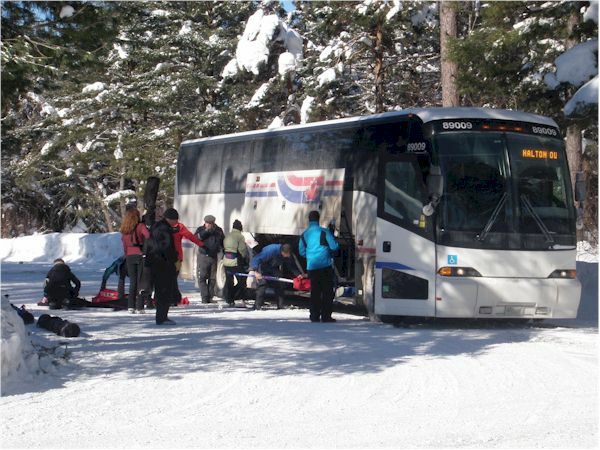 Luxury coaches take us to snow country where we use a variety of ski resorts, most about two hours from Burlington. Trips run on most Saturdays and Sundays from early December through to the end of March. We usually pay less for trail fees as a group. Ski resorts provide well-groomed, track-set trails and a choice of short, easy or long and challenging routes. You will always find companions to join on the trail and on many trips we offer optional guided skiing. There is a friendly and helpful trip leader on every day trip to provide information on the trails and to ensure that the trip runs smoothly. We offer long weekend trips, trips of four to five days, and ski vacations of one to two weeks. Trips may be by luxury coach or by air. Examples of coach destinations include The Gatineau’s; Lake Placid; Sault Ste. Marie; and North Bay. Further adventures by air have included 9-day trips to Silver Star, British Columbia; the Yukon; California; and Canmore, Alberta. Trips of up to two weeks to the Dolomites in Northern Italy have been highlights. As the HOC is not-for-profit, all trips operate at reasonable rates. Each season we attempt to run several trips to suit various budgets. The Halton Outdoor Club has well-trained and experienced ski instructors who teach various levels of Nordic Skiing. Classic lessons are held at the beginning of the ski season. Skate ski lessons take place mid season. All lessons are held in conjunction with skiing day trips. 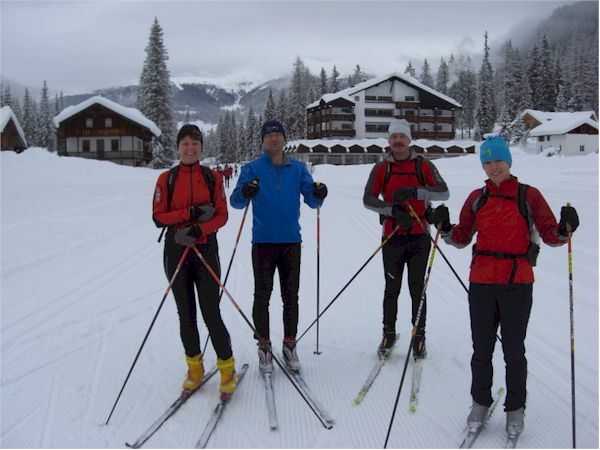 In your class you will meet friendly skiers at your own level with whom to enjoy the trails on future trips. Snowshoeing is available at most of the areas where we ski, usually on trails specifically groomed for this sport. Several guided snowshoe hikes are scheduled in conjunction with the skiing day trips.Some members enjoy a half day of skiing followed by a half day of snowshoeing as a ski pass at all resorts allows snowshoeing without additional charge. For skiing and snowshoeing most venues offer rentals. If you are a new skier we recommend that you rent equipment rather than borrow as it is very important to get properly fitted equipment.Our members and instructors are willing to provide useful information on the selection of appropriate equipment if you plan to purchase in the future. The most important things to bring are a spirit of fun and adventure, a love of the outdoors and, of course, a sense of humour.